Directed by Tim Johnson. Produced by Chris Jenkins and Suzanne Buirgy. Screenplay by Tom J. Astle and Matt Ember. Release date: March 27, 2015. 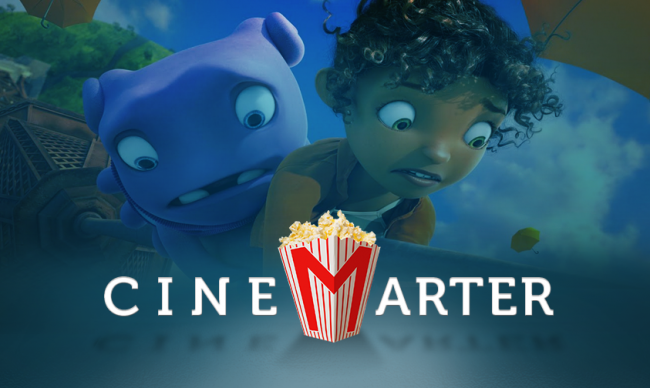 Home is the type of movie you get when you take a singular theme - in this case, the importance of family - and decide to create an entire children's movie around making sure the kiddies understand just how darn important it is. Based on the book The True Meaning of Smekday, Home starts with a very interesting premise, and then proceeds to waste it by doing nothing of importance for most of its running time. It functions much like a road movie, but without the important character-building stops along the way. That premise sees an alien race called Boovs invading Earth in order to hide out from the evil Gorgs. They put humans in a utopic - if you're a child - society in Australia and take the rest of the planet for themselves. Oh (voice of The Big Bang Theory's Jim Parsons) is a Boov who doesn't fit in with the others. Why? Because the movie said so, that's why! It's irrelevant, anyway. He's The Special of his race, so when he makes a mistake where he accidentally invites the Gorgs to Earth for a party, he's declared an outlaw. While on the run, he meets Gratuity "Tip" Tucci (voice of Rihanna), who is named that way because creativity is dead. She managed to avoid relocation, but misses her mother. Tip is a young teenager but sounds and acts like she's about 25. One has to guess Rihanna was cast simply so that she'd have incentive to provide half of the soundtrack. Both of these characters are on their own, and since Oh is a Boov, he can help Tip find her mother. So, they team up. Most of the movie is spent getting to Paris, where not only can a magical supercomputer find Tip's mother, but Oh can also fix his mistake by stopping the email from making it to the other end of the galaxy. It takes hours for mail to travel, you see, but if you hit "stop," even if it's a second away from reaching the other side, it'll work instantly. Sorry, I'm thinking too hard about Home, which is to say that I'm thinking about Home at all. It's all done so that Tip can tell us how important family is, so Oh can learn how important family is, and for the film to tell the children of the audience that they should love their parents forever and ever. Worse messages can be relayed, but when the film is so single-minded that this is all that can be reaped from it, anyone over the age of 10 - and that's being generous - isn't going to get a whole lot from it.